Bennett tweeted several images from a photo shoot that she took to mark graduation. 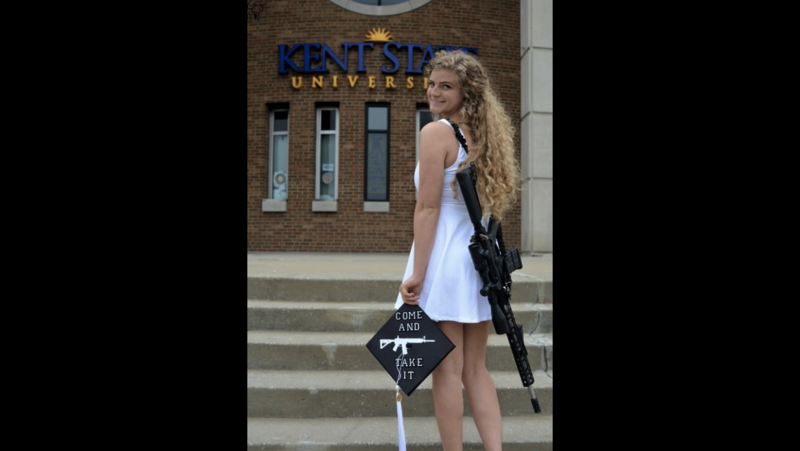 In the photos, she poses around Kent State University's campus wearing a white dress and and a gun holster around her body. She explained in one tweet that the gun is an AR-10 and it "fires at the same rate as any modern pistol," not an assault rifle. It is a tradition at many colleges for students to decorate their graduation caps with clever sayings and personal messages. The message Bennett chose: "Come and take it," referring to her gun. Some Twitter users replied to Bennett's photos with disapproval or worse. She posted screenshots of her exchange with an aggravated Twitter user who appeared to threatened her physically. Bennett says Twitter suspended that person's account. "This rifle is legally owned. Assault rifles have been banned for decades. Do you not see the problem here? You say you don't want to take away legally owned guns, but had NO IDEA that the rifle pictured is legally owned," she replied to other commenters. When someone questioned if the police would support Bennett's public display of the firearm if she were black, Bennett replied. "The black officer that was with us during this photoshoot loved it, actually. Give him a call," she wrote. Bennett also got support on Twitter, with one person writing, "The gun offsets your dress beautifully!" "Stand your ground. You go girl a lot of us have your back," another commenter wrote. "promoting peace, prosperity and property rights since 2015," according to its website. The college student-run organization is a right-wing group that vows to protect the Second Amendment. Bennett said in a tweet that now that she has graduated, she is allowed to carry a gun on campus. However, Kent State's policy regarding deadly weapons states "Students, staff, faculty, and third parties doing business with the university are further prohibited from possessing, storing, or using a deadly weapon while outside on university grounds, that is owned, operated or leased by the university."